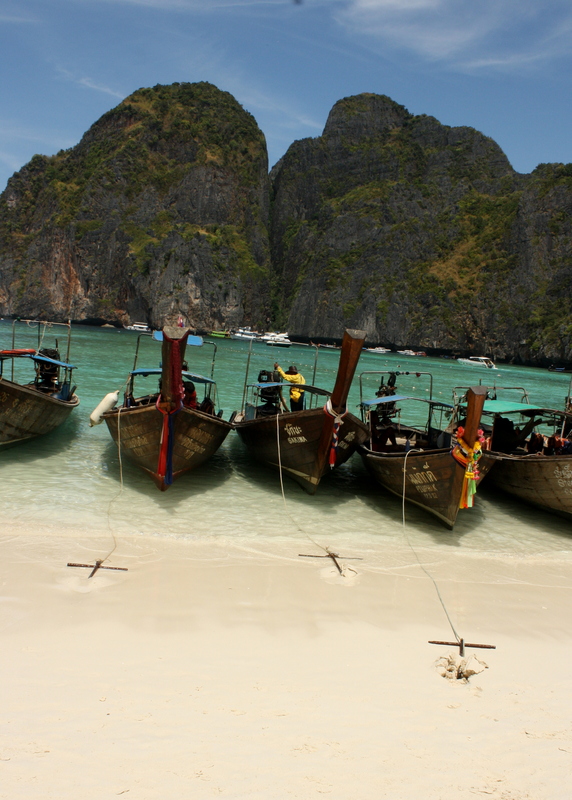 If you have ever seen the movie “The Beach,” then you have seen the Ko Phi Phi Islands in Krabi, Thailand. If you haven’t, then you are missing out on seeing one of the most beautiful places in the world. Of course, instead of watching the movie, you can go there. Which is what I did, and despite the hoards of people, beer cans strewn about, and constant chatter, it truly is a breathtaking sight. From the Good Dream Guesthouse in Krabi town, I booked a Phi Phi Islands day trip by speedboat. I was picked up around 8:15 the next morning and taxied to Ao Nang where I was joined by twenty other passengers or so on the boat. I had heard that a speedboat ride in the Andaman Sea was quite an exciting one and I was reminded of that advice the first time I was vaulted off of my seat and got at least three inches of air. Let’s just say, the 45-minute boat ride was not a relaxing one and I decided I would high-jack a seat in the front of the boat after our first stop (which ended up being much more violent, but I did get to feel the wind, so it was a necessary trade-off). Our first destination was Bamboo Island and it was absolutely stunning. The beach where we landed was extremely crowded so I decided to go on a short walk and found myself on a deserted, albeit small, stretch of the island and set up came here for the hour we were allotted on the island. I posed in pictures (as a photographer I bring my tripod everywhere I go, and yeah scenery is great and all, but I want to be in the pictures! 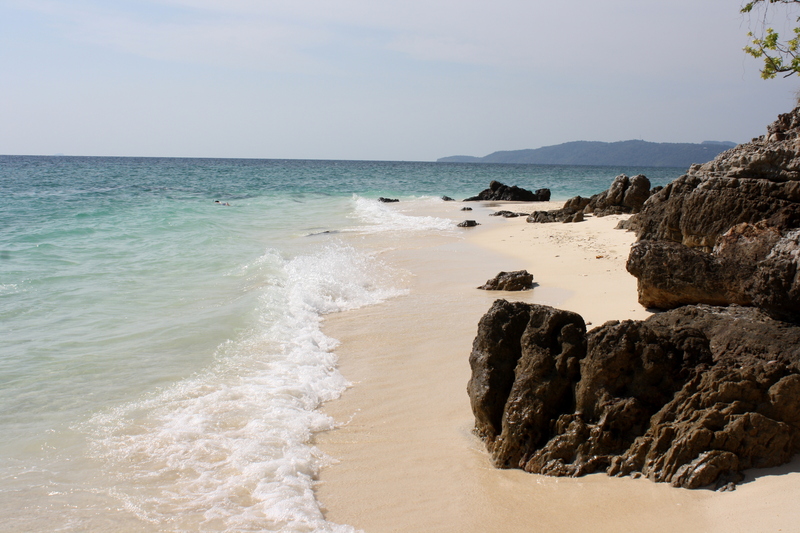 ), swam, and sunned myself on the white sand beach. I would have loved to stay on that island all day, but of course, there was more to see and do. 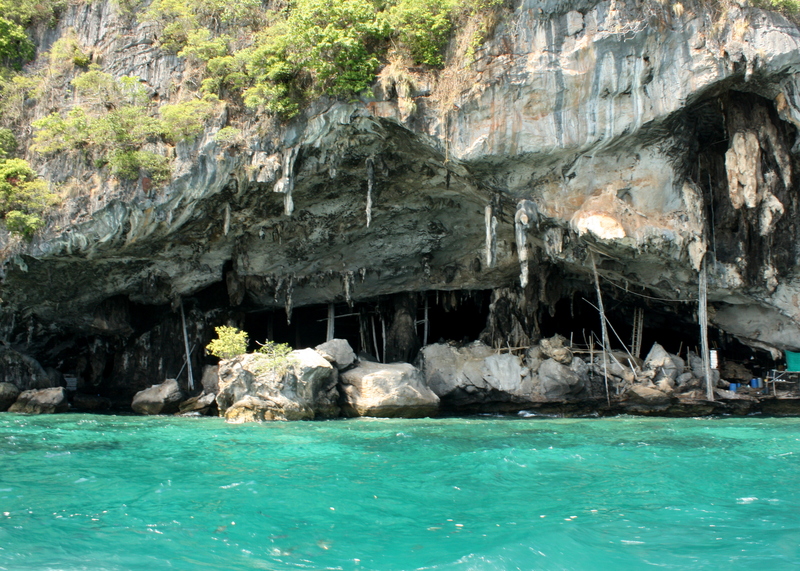 The speed boat of terror’s next stop was the Viking Cave on Phi Phi Ley Island, where thousands of swallows take up residence. I believe on some tours you are able to go inside this enormous cave, but we were not able to partake in this excursion. We floated outside the cave for about five minute and then were on our way. I would have loved to explore the inside, although caves definitely have an eerie, if not creepy, feeling to them. The Phi Phi Ley Lagoon was next. We did a quick drive through, adeptly navigating through the other speedboats and longtails that had decided to do the same thing. It was breathtaking. Immense rock walls plunging into vividly clear blue water. We were surrounded by the pure beauty of nature. I love lagoons. There is just a wonderful peacefulness about them. There’s no beach for people to hoard onto. Just boats and although there were about ten boats or so in the lagoon, it still was gorgeous. 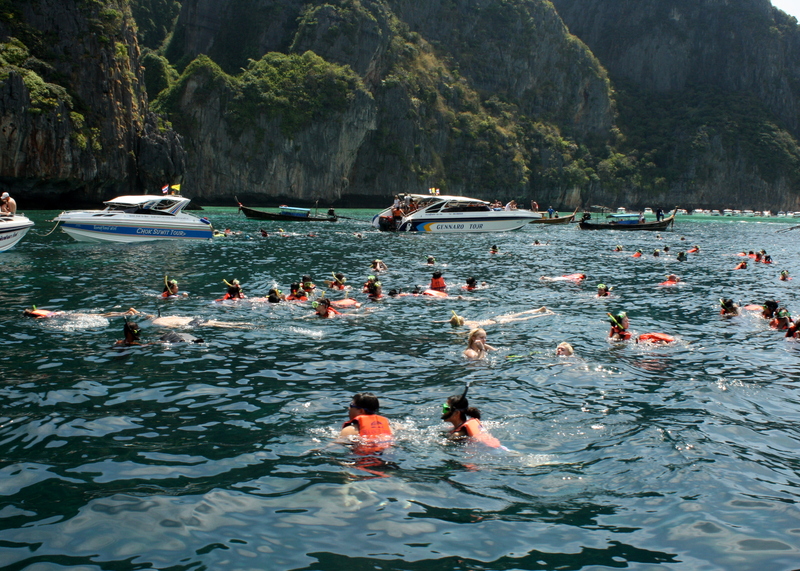 But most of the time, a lagoon can be completely blown out of the water by a beautiful bay, and that is exactly what Maya Bay does to Phi Phi Ley Lagoon. 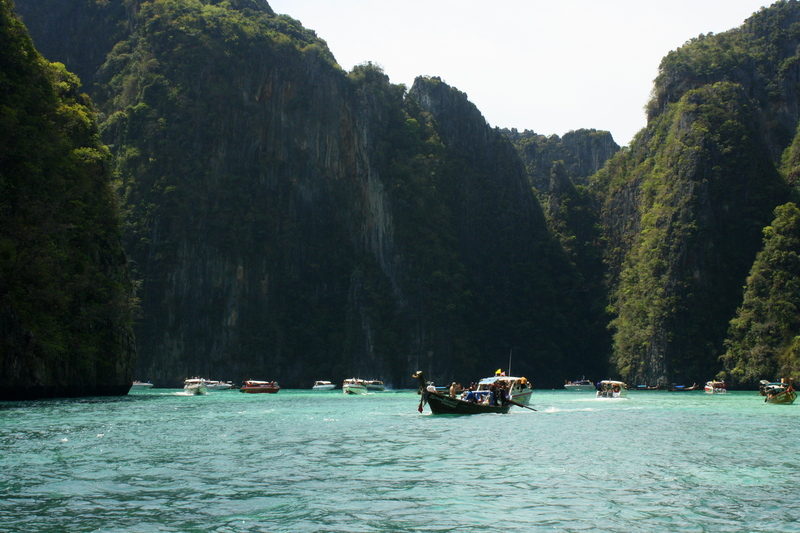 We pulled into Maya Bay a few minutes later, and I have to say I was disappointed. I wasn’t expecting the amount of people, boats, and just all around “civilization” that encompassed the water and beach. We stopped to snorkel and I have never been in the water with that many people. 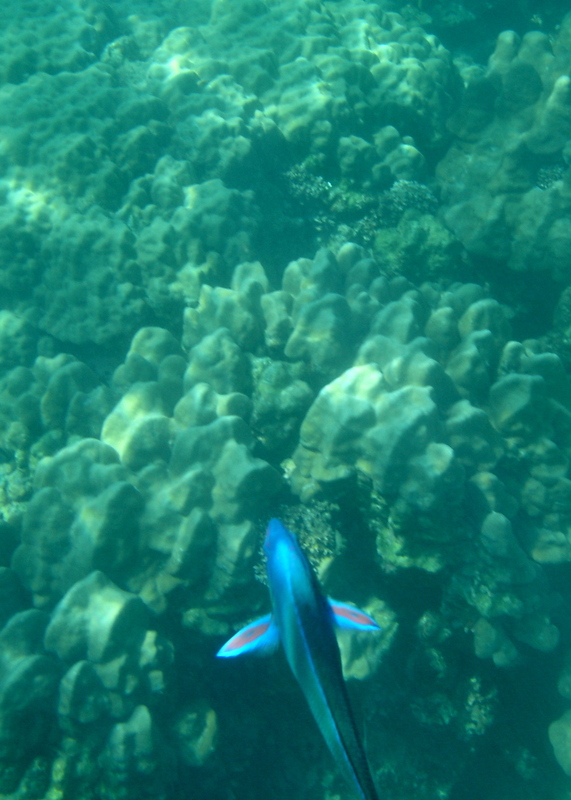 The water was extremely clear and I spotted some fish I hadn’t seen before, but I was constantly being kicked or ran into by fellow snorkelers. Definitely took away from the allure a little bit. After about thirty minutes in the water, we landed on the beach and were allotted another thirty minutes to enjoy the bay. From the beach, the bay was exactly everything I had picture. It was stunning. Of course, it was spotted with people and boats, but I forgot about all that. How can you not when you’re looking at something so beautiful? I would have loved to see it empty, and my friend informed me that you can actually go overnight camping there and thus see the bay empty in the morning. I would have absolutely loved that. That will definitely be on my list of things to do when I come back. Amazingly soft sand! I love it! We stopped on Phi Phi Don for a great buffet lunch that consisted of some cashew chicken, rice, fish sticks and spaghetti. I’m one that must mix all of my food, but this was definitely the one exception (although I did have all three). We had an hour to explore the beaches, shops, restaurants, and bars of Ton Sai Bay and I took this time to finally relax in the sand. It felt so great and its at times like these when I just relish in the fact that I’m on a tropical island. Phi Phi, albeit crowded, took my breath away. I loved every second I was there and it has made me yearn to go back. Camping will definitely be my accommodation of choice because Phi Phi’s popularity has hiked hotel and guesthouses prices up and I’m not into the whole get completely plastered and hook up scene. What a beautiful fish! Sorry the quality isn't the greatest! Our final stop was coral “island,” which wasn’t an island at all, just a bunch of coral off the coast of Phi Phi. It was much less crowded and even though I was exhausted from the day and eager to get back, the snorkeling was once again awesome. Although Ko Tao is known for its diving and snorkeling, I would have to say I saw more fish and prettier coral on this outing than I did on my snorkeling day trip on Ko Tao. I had the most amazing day cruisin’ the Phi Phi Islands and it rounded up my amazing weekend in Krabi, probably my favorite place in Thailand! Check out my Photo of the Day from the Phi Phi Islands! Very tranquil, it reminds me of the Great Barrier Reef. Great post. I’m really looking forward to exploring these islands myself! Great post. Im really looking forward to exploring these islands myself! It is great you are living your dreams. I am all for that. Wonderful pictures too! A few years ago my lady and I where in Thailand. Ko Samet to be exact. I love to swim and it was the first time in my life I got a sunburn from swimming. I must have been in the water four hours! If you are interested we just visited Nice (not so far away) but saw the Annual Carnival event which was all about Our Blue Planet. Wow! Seems to be an amazing place. I wish I can go there someday. This looks amazing!! I would love to take a vacation there! Thanks for sharing..
I’ve been there numerous times over the past 10+ years. One of my favorite places. Far away from everything. Beautiful. (usually) tranquil. Thank you for your article. Beautiful photos. I teach English in South Korea. My contract finishes in March 2010 and then I will be touring Thailand. One of my first stops will be Krabi and the islands. Thanks for sharing. WOW!!! nice place for honeymoon. I love Maya Bay, the place is so relaxing. Great post! My name is Dj and I’m new to wordpress. Hope you could check out my site and comment. Wow! I want to be there too ’cause I love swimming. wow! wonderful place indeed… it reminds me of our own [philippine’s] el nido, palawan. equally amazing boulders and crystal clear waters. Ooooh! I would love to go there! Someone on Twitter just posted a picture of El Nido and it was stunning!! That will most definitely be on my list of places to visit!! Thanks for posting your story! I will leave to thailand in november. Still doubting which camera to take…my Nikon D70 or my canon powershot..? What would you recomment? I would definitely bring both. I’m guessing your powershot is a handheld right? I have my Canon Rebel XS, my Canon Powershot, and a Sony Cybershot with a waterhousing. I’ve used them all extensively and I would recommend bringing as much as you mind carrying! Thanks for you reply. I thought it would be stolen…and I probably won’t have such much space… Haha! I will be backpacking for 3 months… The canon is a powershot 1s is. I have a waterhouse too. I thought of only bringing that one. But it wouldn’t make such nice photo’s! wow… can’t wait to be there on March 29 ’10. Back in ’97 I stayed at the Phi Phi Island Beach Resort around the back side of the island. No crowds, quite peaceful and very beautiful. You could walk to the top of the hill and watch the sunset or sunrise ( or both). No tv’s, no phones; just utter tranquility. Would like to go back. Have fun traveling. I enjoyed going to new places and meeting new people. The viking cave looks positively fascinating! First time here. Keep living your dream. One day, we’ll pluck up the courage to just go travel the world! I’ve actually been inside the Viking cave. It’s VERY big inside. I think they stopped doing tours in there due to the ecological damage that was being done, and the disturbance to the caves natural dwellers. Thailand being what it is, you can probably find a way inside if you are persistent enough. I was glad I saw it. Looks like paradise! I didn’t explore any of the islands when I was in Thailand but this post gives me a reason to go back. wooohhh…. it’s looks like pulau seribu in indonesia.. very beutifull place.. Your manner of writing is so unique compared to many other folks out there. We appreciate you writing when you’ve got the chance.